It took two and a half hours, three buses, and a minor accommodation crisis, but I made it to the 2017 Philadelphia Comic Con just in time for my first volunteer shift on Friday afternoon. Having neither volunteered at nor attended a fan convention before, I was almost vibrating out of my jeans and official “Geek Crew” T-shirt with nervous excitement for the three-day-long event. 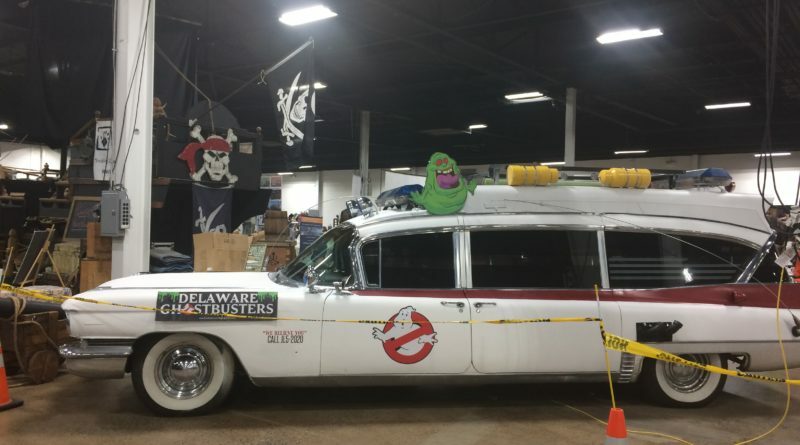 The convention was set up across two halls in an expo center, sectioned off for artists, vendors, exhibitors, actors and panel rooms, respectively. The whole place was quiet and empty when I first saw it the night before during the volunteer training session, as if the building itself was holding its breath in anticipation of the thousands who would soon crowd in through the doors in a celebration of collective nerdery. I’d signed up for a significant number of volunteering hours and so scored a free meal per day and a complimentary weekend pass to the convention. The only downside was having less time and freedom to wander around as a guest. Still, the less cool stuff I saw, the less I’d be tempted to spend, and I was slated for a cushy job helping out in the panel rooms, so I’d get to attend all of the talks and Q&As anyways. But Beth Kovacs, Volunteer Coordinator and all-round superwoman, threw me a curveball barely five minutes after I walked in the door. As it turns out, the panel rooms were running fine on their own. I was promptly transferred to Celebrity Row. This was, without doubt, 100 percent as awesome as it sounds. I imagine it would be quite an emotional rollercoaster if meeting half of your nerdy heroes, not to mention your celebrity crush, was the experience that popped your Comic Con cherry. It was definitely more of an emotional apocalypse for me to get to work alongside mine all weekend. It all began about halfway through that first shift, when I was pulled from floating around keeping an eye on things and assigned specifically to LeVar Burton’s table. You may have heard of him from “Star Trek: The Next Generation” or “Reading Rainbow”: between keeping his rapidly-lengthening line under control, taking photos of him with fans on strangers’ iPhones attempting to squash the fangirl in me screaming, “Oh my stars, it’s Lieutenant Commander Geordi La-freaking-Forge!” and the overall novelty of being at Comic Con, I was way too overwhelmed to actually do my job well. On the one hand, Burton spoke to me directly a few times and was aware of my existence for a full hour and a half. On the other, I was constantly distracted, which must have annoyed him. My mortification was only mildly alleviated when he left for his Q&A and I could finally groan, facepalm at myself, and slink back to the lower-stakes duties of general line management. I made it a point to avoid Burton’s table for the rest of the convention. I may never be able to look him in the eye again. The highlight of my day, though, was attending Jim Shooter’s panel on comic book writing. Now, this man began writing Superman for DC Comics at the tender age of 13, worked his way up through the ranks to become Marvel’s Editor-in-Chief, founded Valiant Comics, and cemented his place as a legend in the comic book industry. Despite technical difficulties and what had clearly been a long and rough journey to get to the convention, he delivered some of the best advice I’ve ever heard on writing with impeccable eloquence. His incredible storytelling abilities shone through in his speech, captivating the audience the same way his comics do. I got to meet the man himself at his table afterward, though I found myself completely tongue-tied in the presence of someone who clearly knew just how much his skillset was worth, yet retained a deep sense of humility and honesty that so many talented individuals lose. He was incredibly sweet and kind enough to give me an autograph on a small scrap of paper containing his rough doodle of the Defiant Comics logo without so much as raising an eyebrow. 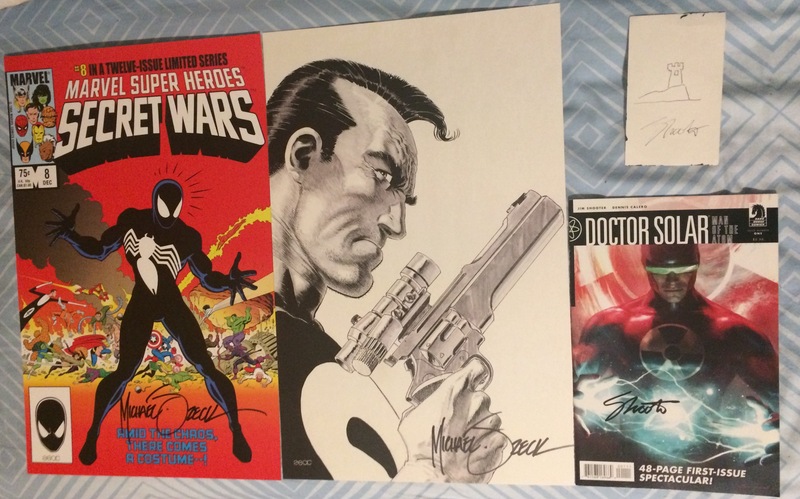 When I came back to him on Sunday to ask for his autograph again, this time on a Doctor Solar issue that he wrote, I’m sure he remembered me as the odd, awkward child who could barely stammer out that she loved his work, but he signed the comic for me just as readily as he’d signed the scrap of paper two days before. Plus, anyone who visited his table got to look through a compilation of letters, articles, comic books and photographs documenting his journey in the comic book industry, dating all the way back to the ’60s. Needless to say, I was there for awhile, flipping happily through his personal history and listening to his occasional commentary on certain pages. Following that, a series of events ended with me befriending a Nyota Uhura (a character from the Star Trek franchise) cosplayer named Joelyn, whom I’d seen at Burton’s table, and her staying with Rachel Davis ‘19 and myself at a hotel near the convention center for the rest of the weekend. Rachel joined us at the convention the next day, cosplaying as Nurse Joy (and later Hoothoot) from the Pokémon franchise. Plus, I ran into several other Swatties who also decided to join in on the fun at the beginning of my Saturday shift, when the crowd was still slowly trickling in … and then the madness of the emotional apocalypse on Celebrity Row resumed, when I got roped into helping out with Brianna Hildebrand’s line. (Remember what I said earlier about a celebrity crush? It was her first day at the convention and fans were showing up in droves to speak to the young Deadpool star. I was on my feet for six hours total that day and did not regret a moment of it, as watching Brianna interact with her fans was absolutely adorable. Ian Garrison ’18, bless his soul, kept texting me from where he was standing in Alan Tudyk’s line to just “Take the plunge and go talk to her!” She ended up leaving the convention before I could pull myself together enough to warrant interaction, so I found myself repeating both the six hours of standing and the not daring to go up to her on Sunday, albeit by then her line had dwindled down enough that I didn’t have to stay rooted to the spot six feet away from her to keep the crowd under control. I did eventually screw up enough willpower to approach her near the very end of the convention and obtain her autograph, along with approximately half a minute’s worth of conversation. She goes from girl next door to badass superhero in about half a second—talk about a girl who can do both. 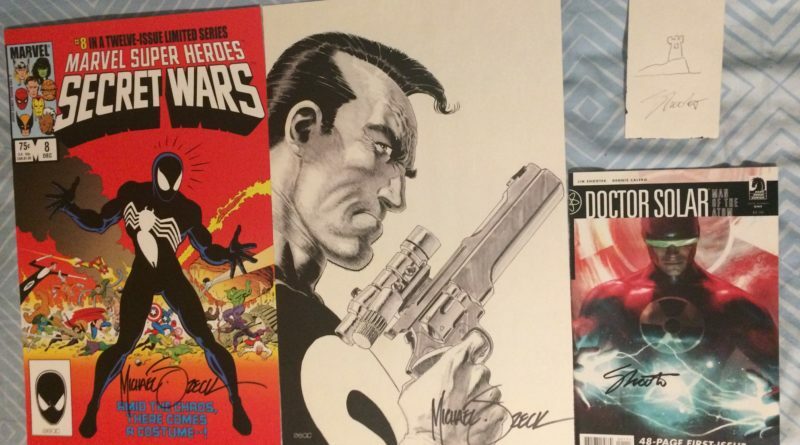 I also had the honor of meeting her Deadpool costar, Jed Rees, and complimented him on how uproariously hilarious he was in “Galaxy Quest.” He recognized me as a volunteer and gave me two autographs for the price of one. Bless his soul—I wish his character had some chance of reappearing in the upcoming Deadpool sequel, but alas. 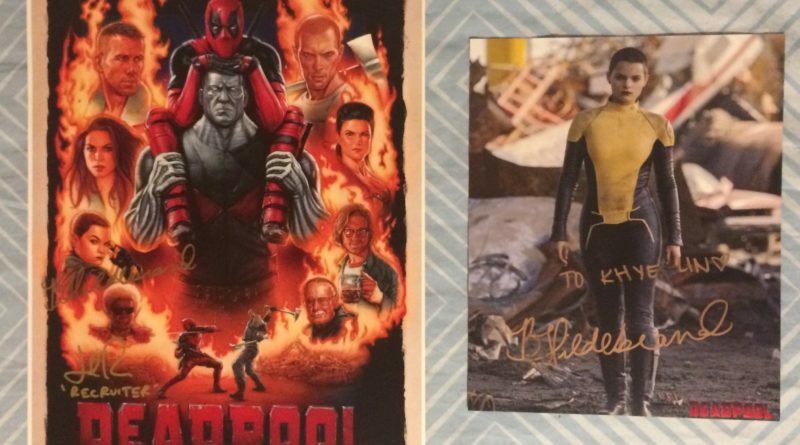 Hildebrand, however, confirmed at her panel that Negasonic Teenage Warhead would return. Cue more internal screaming and a mild existential crisis over the revelation that Marvel owns a disturbingly large portion of my life now. But at last, it was time for the climax of Comic Con: the Cosplay Contest. The halls were packed with cosplayers from every fandom under the sun, some of whom were in it for the trophies, some of whom were just dressed up for the fun of it. 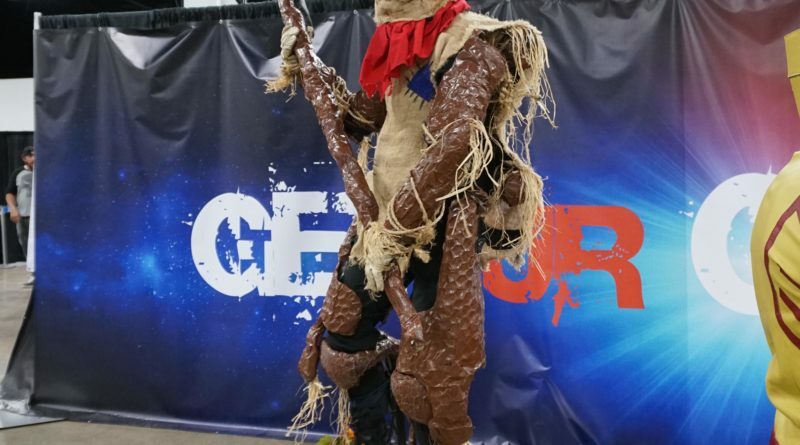 From an eerie Fiddlesticks complete with voice modifier to an actual Iron Man suit of armor, the competition was fierce and the crowd lost its collective geek minds whenever a particularly impressive contender strutted across the stage. 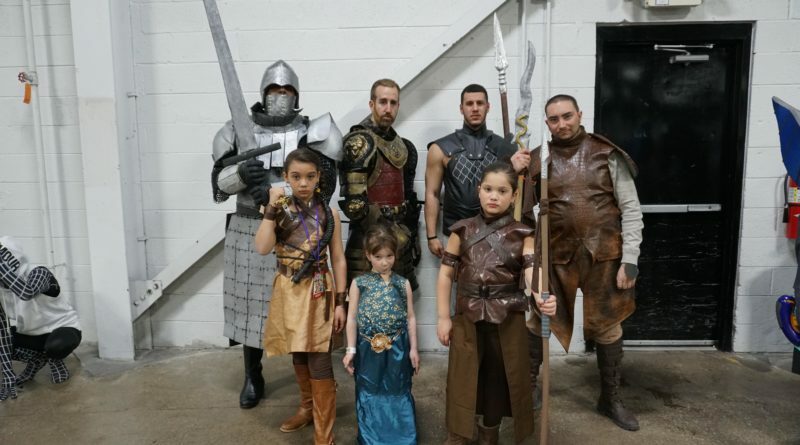 In the end, a Game of Thrones group in armor that one of the cosplayers forged himself took home the prize for Best Overall. If the rumors are true, it was a well deserved win: I was told that each of the men’s outfits took several months to make, and on top of that, there was the task of creating the girls’ dresses. Sunday made for a pretty uneventful volunteering (i.e. people-wrangling) experience, so I managed to wander a little farther than I’d done the previous two days and browsed the artwork, costume accessories, comic books and other fandom paraphernalia for sale. Most of what I ended up purchasing was artwork, most notably a gorgeous Tommy Castillo piece that I would totally show off in a photo, except I didn’t want it to get squashed on the bus ride back to Swat and his lovely wife Sammy offered to ship it to me for free. I’m left counting the days till I can pick it up at the post office and it will be the first thing I unpack when I move into my new room next fall. The thing is, Comic Con is more than just the culmination of years of obsession over a beloved franchise. It’s a space for nerds to geek out unabashedly without fear of judgement. There’s very little judgment to be found at Comic Con (unless you count the Cosplay Contest judges) and the fantastic nature of the fandoms represented at this event allows fans to stretch the boundaries of their imagination far beyond the four walls of the convention center. It’s not a perfect space, of course, but for many guests, it’s a refuge, and they empathize too strongly with the need to occasionally escape from their daily lives to want to ruin this shared haven for someone else. The convention’s mere existence has the potential to change lives for the better by providing a hard-won place for us geeky misfits to belong. And, if you ever encounter that one jerk who just has to rain on the brightly-costumed parade: have no fear, the Geek Crew is here.